3 13/16" x 2 5/8" with rounded corners. Standard adhesive, Six per 8 1/2" x 11" sheet. 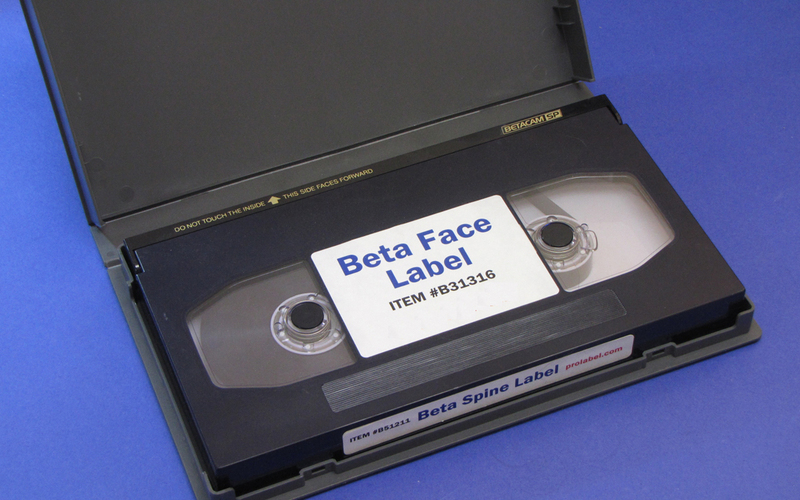 These Beta labels are a custom fit for the large and small tapes in the entire series of Beta Videotapes, such as Beta SP, Digibeta, Beta SX, HDCAM, etc. They work well with laser or inkjet printers. When printing using a template, always make sure the print driver is set to "Actual Size"
This EasyFast template prints a fixed layout of up to 11 lines in 14 point bold. It opens in Adobe Reader. This is a standard PDF template for the Beta face labels - use with Adobe Illustrator, Acrobat, or Photoshop.